This is a review for a supplement called Focus Boost. The manufacturer claims that this supplement will improve focus, memory and alertness. Read on to learn more about this product and whether or not it is the ideal choice for you. Bacopa-Works to boost energy levels. Acetyl-L-Carnitine- Works to enhance memory. L-Theanine– Works increase energy and provide sense a calm. Citicoline– Works to increase motivation, focus and ability to learn and memorize. It is recommended that the supplement be taken as needed. Doses should only be taken every four hours. There was no list of possible side effects listed on the manufacturer’s website, but it was noted that customers should not take more than the recommended dosage or take the supplement with alcohol. It was recommended that those with a sensitive stomach take this supplement with a small meal. Women who are pregnant or nursing are advised to consult with a doctor before they use this product. This supplement can be purchased for the following price: $39.95 for one bottle with 30 capsules. $67.92 for two bottles with 30 capsules each. This is a 15% savings. $89.89 for one bottle with 90 capsules. This is a 25% savings. Multiple buying options allow the buyer to save more money the more bottles they purchase. The manufacturer offers a 100% money back guarantee for this product. If anyone who purchases this product is dissatisfied with the results, they can return the product for a full refund if the return is made within 90 days of the purchase. The manufacturer’s website features a few customer testimonials from people who have tried the product. These testimonials are positive and seem to back up claims about what the product does. 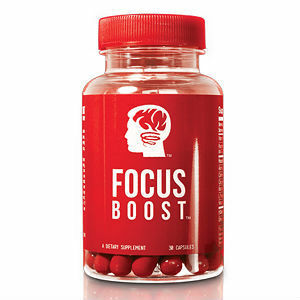 Focus Boost is said to improve focus, memory and alertness. Even though there are only a few testimonials from customers on the manufacturer’s website, they all seem to express their approval of this product. This is a good sign that Focus Boost does work. Buyers should keep in mind that individual results may vary, so just because one person experienced positive results from taking this supplement, it doesn’t mean everyone will. The buying options that are available to customers means people don’t have to purchase every bottle at the same price. The more bottles you purchase, the more money you save. Customers may not want to purchase more than one bottle when they are first trying it, but with the 100% money back guarantee, they can get a refund for whatever they purchase as long as it is within 90 days. This is longer than what is usually allowed by most manufacturers who require the return be within 30 days of the purchase. Overall, Focus Boost seems like a good product that has worked for many and could work for you. Henry Costa	reviewed Focus Boost	on June 18th	 and gave it a rating of 4.